InterBasket > Player Profiles > Drazen Petrovic, Croatia > talk In Honor of Drazen Petrovic (Nba.com): "...before his death, Petrovic made his mark in the NBA and around the world. To match the cool grace of urban American talents, the European newcomer brought tireless enthusiasm to the game, as illustrated by his fist-pumping in moments of triumph and furious agonizing over setbacks. He was not as strong defensively as his American counterparts, but he showed a penchant for daring three-point shooting. "I have never seen any pro or amateur player work as hard," Nets Assistant Coach Tom Newell told the New York Daily News. "He's the consummate pro in commitment and dedication." 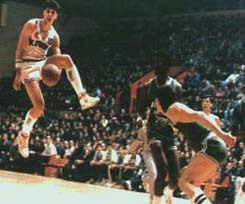 Petrovic had shooting skills to match his energy. In his two full seasons with New Jersey he averaged 21.4 points. In his best-and final-season, 1992-93, he led the Nets with 22.3 points per game. "Even if you were a fan of another team, you couldn't root against him," teammate Sam Bowie told the Newark Star-Ledger. "You had to be impressed by him." The son of a police chief, Petrovic grew up in Sibenik, a small port city on the Adriatic Sea. He and his brother, Aleksander, spent hours teaching themselves basketball on makeshift courts... (more...)"
From Fiba.com: "In 1989, the Yugoslavs assembled all of their “golden generation” in what would turn into a 3-year dominance of world basketball (European titles in 1989 and 1990 and a World Championship in 1991). Drafted: 1986, Third Round, 60th pick overall by the Portland TrailBlazers. Ibn Notes: Enshrined into the Basketball Hall of Fame as a player on September 27, 2002 "Drazen Petrovic was an extraordinary young man, and a true pioneer in the global sports of basketball. I know that a lasting part of his athletic legacy will be that he paved the way for other international players to compete successfully in the NBA..."
Ibn Facts: Back in 1991, FIBA named Petrovic as one of FIBA's 50 Greatest Players with the likes of other international basketball legends Arvydas Sabonis, Nikos Galis, Dino Meneghin, Juan Antonio Corbalan, Oscar Schmidt, Teo Cruz, Sergei Belov, Modestas Paulauskas, Toni Kukoc, Alexander Volkov, and Vlade Divac among others... the list was determined by votes from a group of international experts and coaches. From Wikipedia.com: Dražen Petrović's scoring average during the four years with Cibona stood at 37.7 points in the Yugoslavian first division and 33.8 in European competitions, with amazing personal one-time bests of 112 and 62 points, respectively. His performances were dazzling as his numbers were surreal: he was known to score over 40 points and dish out over 20 assists in a game; in an 1986 European League game against Limoges, Petrović scored 10 3-pointers, including seven in a row during a first half stretch, for a final tally of 51 points and 10 assists.